Roots of Modern Plant Biology. Plants have roots. And a new way of imaging them was recently published in eLife. It’s called GLO-roots and is a way to monitor roots growing in soil as well as track gene expression in those roots via glowing reporters detectable by a very sensitive imaging camera. The story of GLO-roots is clever and new, but it has deep links to the past as well. GLO-Roots, showing an image of imaged roots from both sides of the rhizotron, merged in the middle to show the whole root system. From Rellán-Álvarez et al. 2015 (see References below). At The University of Würzberg. The lecture on plant tropisms had gone well. A good break of his typical 16-hour workday. Now it was time to get back to the laboratory to look in on an experiment he was excited about. Dr. Julius von Sachs looked through the glass. Soil pressed up against the side, nearly overflowing the box. A stem and several lush green leaves sprouted from the surface of the box, but he wasn’t interested in those today. He was staring through the glass at the soil, seeking the roots the plant put down. Looking closely with a magnifying glass he looked closely at the roots, looking for the cellular protrusions, root hairs. They were there, and looked intact, healthy. He shifted his gaze to an adjacent box, one he had not watered recently with wilting leaves. The root hairs were still there, but those newly formed appeared shorter, and more bulbous. It seemed that root hairs were fully formed and spread out under water replete conditions while they were much shorter under arid conditions…something worth exploring more, certainly. 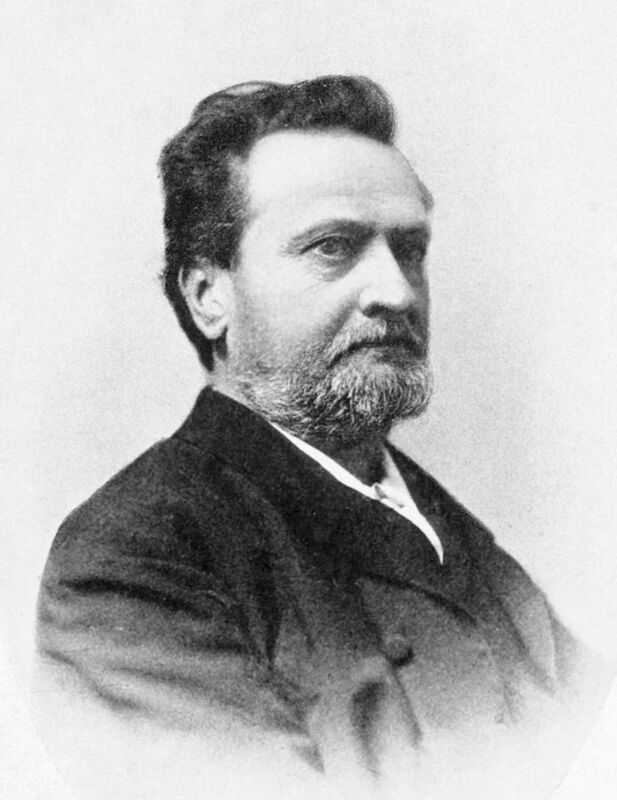 Julius von Sachs. Source: “Julius Sachs” by Uploaded by de:User:Sixat on de:WP at 00:13, 28. Apr 2004. Licensed under CC BY-SA 3.0 via Commons. I made up the above scene. Sadly, I don’t have access to Julius von Sachs primary notebooks nor a picture of his lab space. Even if I did, I don’t speak German to be able to read them. Julius von Sachs was a big figure in the history of plant science. 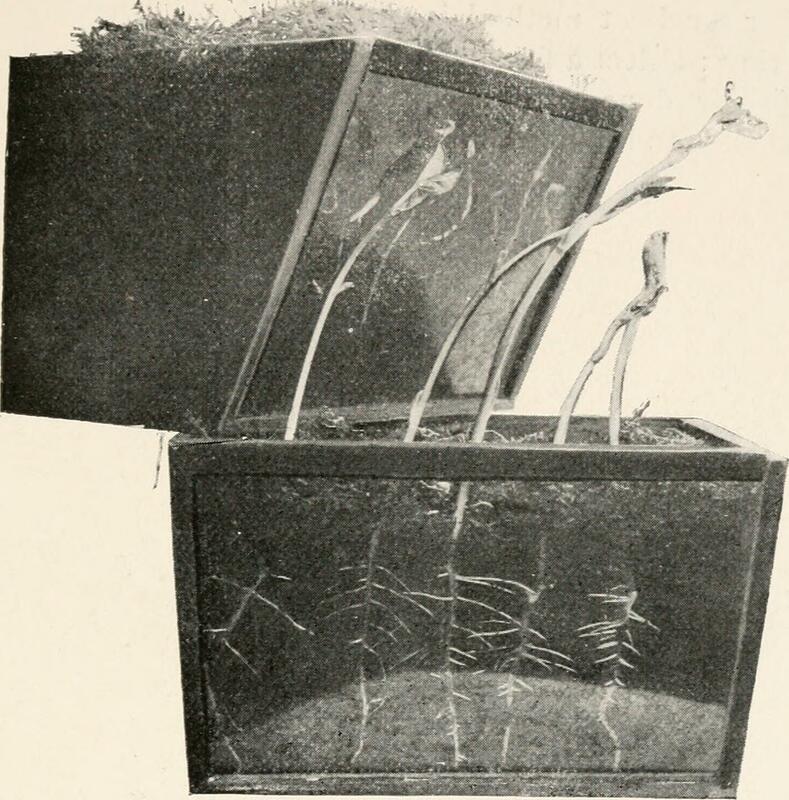 And he really did grow roots in boxes with one glass side in order to observe them. And that’s the tip of a very big iceberg. A better analogy is that it’s the just visible base of an extensive, but invisible, root system of a giant tree. Julius Sachs was a big part of making the study of plant physiology a formal science. An originator of modern plant biology. Gregor Mendel is a better known plant scientist now, perhaps, though his important work on inheritance of traits & genetics was little known at the time and only discovered in the early 20th century. In mid-19th century in Germany, Julius von Sachs ran a world-leading lab and mentored many that went on to successful botanical/plant science careers in their own right. He was a contemporary of several others that were prominent plant scientists of the day– Charles Darwin for one. Though better known for his theory of natural selection more than plant science, Darwin certainly had an active interest in plant biology. His son Francis was one who studied with Sachs. Sachs was given an honorary doctorate at the University of Bonn in 1868 along with Louis Pasteur and Charles Darwin. He was well known in his time. At least one of his students and he also corresponded and got seeds from prominent American botanist Asa Gray while keeping Charles Darwin in the loop as well. The Sachs lab was a hub of plant science. Perhaps most famously, he discovered the tiny green things in plant cells that we now call chloroplasts are where photosynthesis occurs and starch builds up during the day and is consumed at night through respiration (yes, plants respire too!). He also studied how photosynthesis rate changes by studying the rate of bubble production in aquatic plants under different light conditions. Image from page 478 of “Arbeiten des Botanischen instituts in Würzburg” (1888). Author: Julius Sachs. Building on previous work, he invented the clinostat, an automated way to manipulate a plant’s perception of gravity. Sachs pursued and wrote several books on nearly every aspect of plant biology. As the Nature Plants post linked above notes, his 1865 Handbuch der Experimental-Physiologie der Pflanzen (link to Google books) ushered in the era of plants as organisms to be experimented upon, studied, and explained entirely by natural phenomena– physics, chemistry, and biology with no need for a hazy “vegetative force” to drive plant growth and development. Humans have been tinkering and making observations about plants since we evolved, especially after agriculture got going ~10,000 years ago. When the scientific revolution really got going in the 16th century, plants were a part of it (e.g. We get the word cell because of observations of cork from the first microscope). In the 16th-19th centuries, scientists figured out some aspects of how plants worked. By the time Sachs was working, he improved and formalized the study of plant physiology. This was in contrast to traditional botany, the collection, identification, and classification of plants in nature. Of course, a goal of botany and plant science generally is putting plants to use as well. Arguably Sachs took advantage of plants botanists discovered first. Sachs marked a formal start of studying the mechanisms of plant growth and development. Charles and Francis Darwin published their book on plant movements in 1880 as another sign that plant biology was changing to focus more on how plants worked (Plant Physiology) and less on what plants were out there (Botany). Botanical gardens were repositories of empire building and colonialism. Moving plants around the world to farm them in foreign lands. Coffee moved around the world from its center of origin in modern day Ethiopia. Vanilla was grown all over the world from its new world origins. Botany mattered to the success of nations. Having rare and exotic plants AND successfully propagating them was a status symbol as well as economic engine. Botanical gardens today have a quieter but no less critical mission: conservation, preservation of plant genetic diversity, species diversity, and carefully documenting the world’s plants. And they now work with partners in nations all over the world in conservation and preservation of Earth’s plant life. Plants are equally critical today, but we’ve lost sight of that fact in the developed world at least– plants are relegated to a green screen medium we walk through. Sachs may not be as well known today because of the documented phenomenon of plant blindness. And like many places in science these days, funding for some gardens is tight. Sachs marked a formal start of studying the mechanisms of plant growth and development. Charles and Francis Darwin published their book on plant movements in 1880 as another sign that plant biology was changing to focus more on how plants worked (Plant Physiology) and less on what plants were out there (Botany). A Google ngram search shows the decline of botany as a term in books from a high point in 1800 through 2000. Some universities have no departments of botany anymore; they’ve been shuttered or folded into other departments. Though this may reflect a changing world of research where botany has simply changed form, it is true that plant sciences are not as well funded as other branches of life sciences. Plant Physiology shows it’s rise as a term starting in the 1880’s and rising ever since, slightly pre-dating genetics. It is notable that botany is still more common a term than plant physiology, plant science, or plant biology based on Google books’ database, though it is the only term trending down in this search. Plant biologists can rejoice that a plant scientist will feature prominently in a big movie (based on an apparently great book that I need to read), “The Martian” with Matt Damon playing Mark Watney who has to survive on Mars in part by using his knowledge of plant biology to grow crops in Martian soil. Botanist Chris Martine is even naming a plant after Watney. Coincidently, the movie is opening on Julius Sach’s birthday. From Sach’s era on, plant biology got a lot more reductive (science in general did too), diving into what happened inside individual cells and tissues. This meant not paying as much attention to the whole organism. Genes were discovered (again in the 1860’s by Mendel, but only retroactively recognized for it). Barbara McClintock made the remarkable discovery of “jumping genes”, a hint of the complexity and dynamism that scientists are now observing in genomes and cells. Even industry/agriculture got more reductive, going for the few traits desirable to growing/producing yield and uniformity, and ignoring flavor and potentially other desirable traits as well as diversity. Edible enough was the standard. The commercial tomato is a good example of this. In fact, the food secure world many of us live in (though certainly not all!) gives us the luxury to think about flavor more than merely surviving (flavor is not always correlated with nutrition). As technology has gotten better, and the computer has displaced the microscope as the most essential tool for doing biology, there is starting to be a return to studying plants as whole organisms. An attempt to study plants where they naturally live. As technology has gotten better, and the computer has displaced the microscope as the most essential tool for doing biology, there is starting to be a return to studying plants as whole organisms. An attempt to study plants where they naturally live. In nature or out in a farm field. At the very least bringing more field like conditions into the laboratory. It is decidedly noisier and more complex to study plants this way, but finer methods allow for detection of ever more subtle effects— to the point where signal and noise can be hard to distinguish. GLO-roots is an example of integrating the cellular with the whole organism. The Zen of Plant Physiology as senior author of the eLife study José Dinneny has written. It is closer in spirit to the research Julius Sachs did. The technology was developed in the lab of Jose Dinneny with contributions from labs in several other places around the world to make a better technology. It brings together a lot of developments in plant biology. Though they are adapting the technology to other plants, they started with Arabidopsis, still a common model used in plant research. Right after arriving to Carnegie José started to think about innovative ways of studying plants on ways closer to what plants experienced in the wild. This is especially important root biology where root phenotyping is usually at conflict with the conditions roots experience in their natural environment. His idea was to use rhizotrons filled with soil and Arabidopsis transgenic plants expressing luciferases to image root system architecture and gene expression. I immediately fell in love with the idea and with José´s approach to study root biology. Being a plant physiologist by training I appreciated the effort of a plant developmental biologist to use technology and molecular biology to better understand how plants interact with their environment. Julius Sachs taught, ran a laboratory, and was otherwise involved in carrying out scientific investigations into plants in the 19th century. The German academic system is the one we might most recognize today. Along with Darwin in England, Asa Gray in the United States and many more contemporaries, all pursued plant research in the mid-late 19th century and laid the foundation for plant science in the 20th and 21st centuries (as well as contributing to other fields of science). Although Sachs was certainly a part of a community of researchers that shared findings and materials/methods, he still largely published as a single author. The GLO-roots story demonstrates how science has changed to have international teams coming together to develop all different aspects of a project. In this case, generating the plants, the imaging system, the image processing software, and other researchers bringing ideas of experiments that can be done with the new system. In Sach’s time, it was possible for one person to do everything and be expert in it all. Now that is not as possible. This doesn’t take away from the individual researchers talents, it just highlights how complex science has gotten. In the summer of 2014, José gave a presentation at the SEB meeting in Manchester and presented among other things the lab was working on our advances with our system. Among the audience was Guillaume Lobet that at that time was working on a system that presented similar image analysis challenges to our GLO-Roots. I knew Guillaume from twitter and from his phenomenal work in root phenotyping and modelling. Very soon we started to work together in new methods to analyze our images. Thanks to Guillaume we took the image analysis part to a new level and establish a pipeline for our image analysis and trait quantification. This work was crystallized in an ImageJ plugin that is able to perform different analysis. More importantly the data is stored in the RSML (Root System Markup Language) format that allows the storage of different types of information such as root architecture traits, gene expression and soil data such as water moisture allowing us to explore the correlations between them and how they change over time. Together with the groups of Julin Maloof, John Vogel and Fred Ausubel and his postdoc Cara Haney (now a professor at UBC) we designed luminescent tomatos, brachypodium and a Pseudomonas, and tested them in our system. My colleague at José’s lab Jose Sebastian has also been working hard to generate luminescent Setaria plants and is now obtaining beautiful images that is allowing him to understand the mechanism of crown root growth under different water regimes. Three accessions of Arabidopsis imaged with the GLO-Roots system. From Rellán-Álvarez et al. 2015 (See References). Through genetic modification (GMO technologies are a quite useful tool for studying how plants work), GLO-roots expresses an enzyme called luciferase (GLO-roots is using many versions of it to track several different things at once). They then water the rhizotron with luciferin, the enzyme’s substrate. When enzyme and substrate come together along with some energy from the cell, a small amount of light is emitted and that is detected by a camera and then software is used to process the image, generating a sort of a haunting outline of the roots in the soil. The rhizotrons used for GLO-roots are descendants of the ones Julius Sachs used in his lab 150 years ago. GLO-roots is an attempt to study plants in closer to their natural environment with all their complex environmental interactions. Science is hard and reducing variables is generally good to answer a particular biological problem even though this takes an organism out of a fully natural context. Sachs started a revolution in plant biology, actually trying to get at how plants work using ingenuity and inventing new methods and technologies to do so. He collaborated with other plant scientists too. In 2015, new technology and inventive humans collaborating all over the world are still at it, revolutionizing plant sciences slowly but surely. GLO-roots is one example of many stories of contemporary plant scientists integrating the molecular with whole plant physiology in a natural context. The problems (in the research sense) we’re trying to solve now are ones that Sachs may not have been able to dream of. However, it’s the roots Sachs started that have branched and are still nourishing our knowledge of nature today. 03/01/2017 – This Post has been updated to correct grammar and clarify Jose Dinneny’s role in the GLO-roots experiment. Pingback: Resolution of roots over time.